BOSTON, Mass. – Heading into the third period down by a single goal to defending Div. 2 state champion Notre Dame Academy (Hingham), the Canton girls’ hockey team was probably thinking that it had the Cougars right where it wanted them. The Bulldogs (14-5-6), who entered the playoffs as the No. 14 seed, had shown a propensity for coming from behind to pull out wins during an improbable tournament run that had brought Canton all the way to the TD Garden for its first state title game appearance since 2006. Despite being behind by a goal, the Bulldogs remained confident. Canton did come back and tied the game early in the third period. Andrea McNeil popped in a backhander on the rebound and fired up the large contingent of fans that made the trip up 93 for the early morning game. 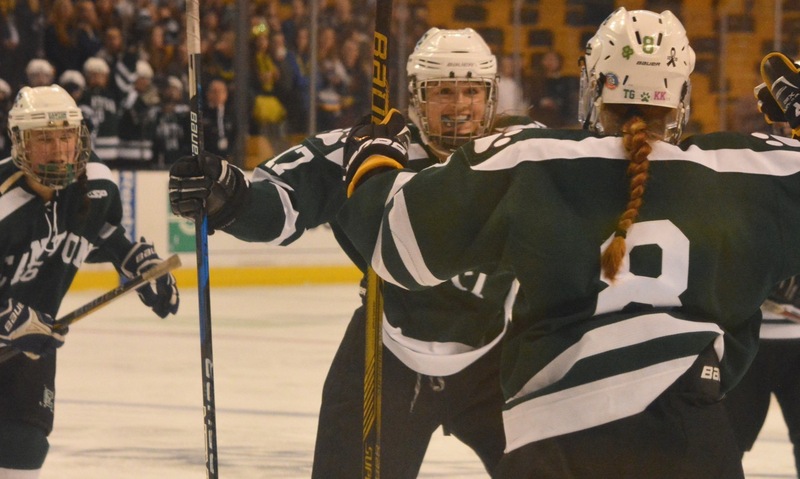 However, the Cougars (23-0-1) responded just nine seconds later to regain the lead and freshman Katherine Pyne caught fire, scoring all four of NDA’s goals in the third period, while classmate Skyler Irving added a goal and three assists. The Cougars skated to a 5-2 victory and back-to-back state titles, despite a roster that has zero seniors. Defense has been the strength of the Bulldogs all season. Sunday’s final was only the second time this year that Canton allowed an opponent to score more than two goals in a game and the first time since Barnstable scored four all the way back in December. That defense was put to the test against the high-scoring Cougars. Junior goalie Colleen Kelleher stood tall to make an early save on a scoring opportunity for Emma Duffey, but six minutes into the game Irving reacted first to a rebound and was able to finish for a 1-0 lead. Pyne also had Kelleher beat two minutes later only to see her shot come back off the crossbar. Kelleher made nine saves in the first and the Bulldogs grew into the game as the opening period wore on. Sophomores Katie Trerice and Leah McClellan, senior Molly McLaughlin, and freshman Alexa Maffeo all making solid plays to limit the Cougars to shots from the edges and the forwards starting the defensive effort with an aggressive forecheck. Sophomore Lauren Fitzpatrick had Canton’s best chance of the first period with a solo rush up the right side and a shot from the circle that was blocked aside. Canton took control in the second period and started to create scoring chances by forcing turnovers in the neutral zone. McNeil had a good chance just a minute into the second but her rush to the net was blocked at the last second. Five minutes later, Trerice had a shot through traffic batted away and Ava Bevilacqua took the rebound the length of the ice and forced Kelleher into a save. Kendra Farrelly nearly created the tying goal with seven minutes left in the second but her initial rush was tipped away by NDA goalie Erin Murray in the crease and Farrelly’s deflected follow-up was well saved by Murray. Three minutes later, Farrelly again created an opening down the left but her shot through the crease could not be tapped in at the back post by Fitzpatrick. Just two minutes into the third period, Canton’s seemingly stole the momentum for the game with the tying goal. McNeil pounced on a rebound off a shot by Fitzpatrick and planted it top shelf. NDA won the ensuing face-off and the puck slid all the way down into the Canton zone. Pyne showed off her speed to react first to the loose puck and she buried the chance for a 2-1 lead. The game was tied for only nine seconds. Pyne added a second goal a little more than a minute later, but again Canton showed the resiliency to fight back. Fitzpatrick turned in the high slot and flung a shot at goal that took a funny bounce and ended up in the back of the net. NDA responded quickly to regain the two-goal advantage. Pyne’s wraparound effort slid under the pads of Kelleher, who appeared to have it covered until she was bumped but the goal was given. With 2:26 left, Pyne added her fourth and the team’s fifth to seal the title. Aldrich noted that three years ago, the Bulldogs won just three games. He praised the leadership of the seniors for getting the program to this point. “These guys, especially Rebecca and Kristen (Eckler) being our leaders, kept everyone focused on what we wanted and needed to do as a program. We got consistently better each game,” he said. #1 Foxboro, 47 vs. #7 Westwood, 38 – Final – Click here for a recap from this game. #14 Canton, 3 vs. #11 Winchester, 2 – Final – Canton erased a one-goal deficit on two different occasions and then found the winner in the final seconds. After Winchester went up just over two minutes into the game, Canton sophomore Lauren Fitzpatrick tied the game less than two minutes into the second period. Winchester took a 2-1 lead but senior Rebecca Eckler tied the game with just over five minutes left in the middle frame. Canton took a timeout with 15.4 seconds left in the game with a face off in the offensive zone. The Bulldogs won, got a shot on goal and Eckler pushed the rebound in as she fell to the ice with 10.8 seconds to play. Canton advances to the D2 State Semifinal to take on #7 Westwood on Wednesday at 7:15 at Gallo. MANSFIELD, Mass. – The wind was whipping across Alumni Field on Wednesday afternoon and it felt more like the middle of the winter than the start of spring, but the turf was clear of snow and so Mansfield and Canton each took the field for the second time this season. It took a little longer than usual for the two teams to warm up, the first half was dominated by turnovers and misplaced passes, but in the end the teams went right down to the wire. Seniors Caroline Maher and Julia Todesco each scored hat tricks for the Hornets to pull out a 10-8 victory and push Mansfield to 2-0 on the season. Things did not start well for the hosts. 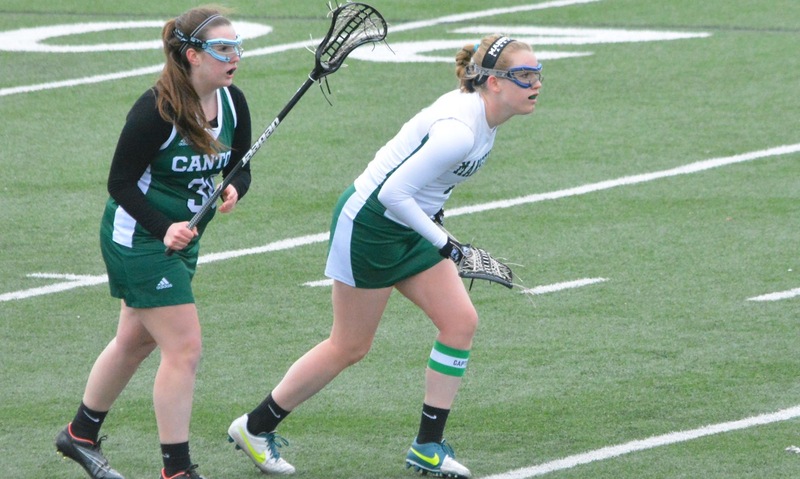 Canton opened the scoring nearly four minutes in when Caroline Hagen bounced a shot past Mansfield goalie Tori Lawlor. Jill Pulutchko answered off a feed from Katie Garvin to tie it for the Hornets two minutes later, but Canton came right back with the first of two goals by senior Casey Bradley, on an assist by Abby Colburn. Todesco and then Maher went back-to-back for Mansfield to give the Hornets their first lead of the game at 3-2 but then Bradley tied the game and classmate Mary Nee smacked the post on a quick break. On her next chance, Nee went over the top of Lawlor (10 saves, seven in first half) to make it 4-3 Bulldogs. Midway through the first half, Kobey made a change on the draws. She put Todesco on the initial draw and moved Maher up to the edge of the circle with Maggie Dunn and occasionally freshman Emily Vigeant to try and gain control. The switch worked and the Hornets won 8-11 draw controls in the first half and 14-20 for the game. Lawlor made a huge kick save to block a chance from Bradley with 9:25 left in the half and two minutes later Maher spun past her marker to tie the game at 4-4. Vigeant put Mansfield ahead at halftime, 6-4, with a pair of goals, the first of her career. 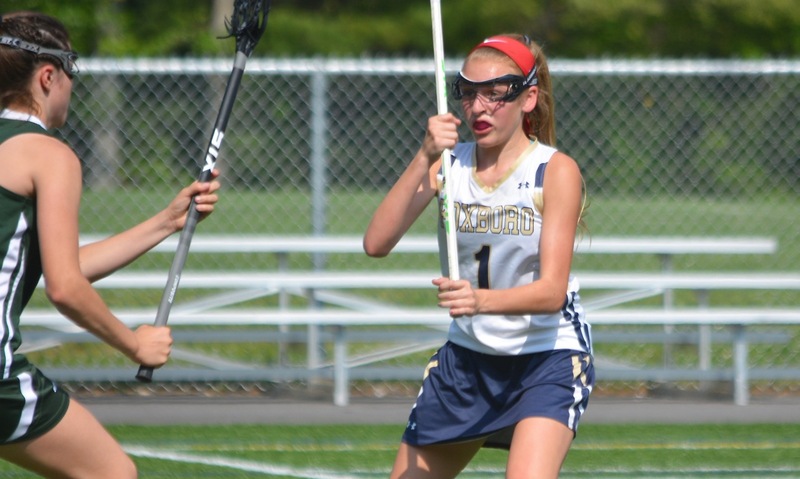 The first came off a turnover that she forced directly in front of Canton goalie Kathryn Doody and the second after she had earned a free position opportunity. Canton came out of halftime with renewed energy and immediately got back into the game. Just 1:43 after the break, Colburn took advantage of a restart with Lawlor out of the cage and found Rebecca Eckler alone in front to make it 6-5. Mansfield pressed forward looking to extend the lead but was denied by Doody, who made seven of her 12 saves in the second half, including four in the opening six minutes. Her stops allowed the Bulldogs to tie the game with 19:48 left on Nee’s second of the game. Mansfield took less than a minute to regain the lead. Todesco forced a turnover in the defensive zone and started a quick transition that went from Mary Folan to Dunn for a 7-6 lead. Olivia Devoe answered right back for Canton from a free position chance, but then Todesco scored two in a row, both slicing across the Bulldogs’ defense, to put the Hornets ahead 9-7. Maroney picked up a card and Canton had an extra player on the field, but the Bulldogs struggled to make the advantage pay. Finally, Nee made a steal on defense and sparked a quick transition. Bradley picked out Hagen in the middle and she cut the lead to just one with 10:57 left. As the clock wound down under six minutes remaining, Canton was probing for the tying goal. The Bulldogs had more than a minute of sustained pressure, but the Mansfield defense was staying with cutters and not allowing good looks. The one chance that the Bulldogs had was stopped by Lawlor. Todesco made another play, this time on the defensive side of the game, when she scooped up a ground ball to end Canton’s possession. The play transitioned into the attack and Maher capped her hat trick with a finish that made it 10-8 with 5:17 to play. O’Connor is in her first year as head coach and has started with back-to-back losses to perennial power Franklin and now Mansfield. Despite the defeats, she is pleased with how the team is coming together. Mansfield will put its perfect (2-0) record on the line on Friday against King Philip. Canton will be looking for its first win on Friday when it hosts Taunton for the first time.